I'm sensing some frustration in those interviews. 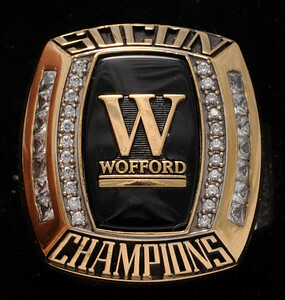 Hoping we put together 4 quarters of Wofford Football. This will be a dog fight. I think the keys for us on defense saturday (and moving forward) will be getting off the field on third down. Against Mercer, Furman and GW we had average days, holding them to below 50% because they run a balanced offense. The interesting stat is Western Carolina and Samford both had less 3rd attempts. That tells me that against such opponents, our problem (like most) is that we gave up way to much yardage on first and second down, but when we were able to force them into third and short, we were able to get them off the field late. So what does this mean for Chattanooga? Well, Chattanooga has been pretty bad on third down conversions this year, averaging 32%. If you take out the VMI game, they're at about 23%. Last week, they were 4 of 14. It's worth mentioning that this low number isn't a gimme for us, as the Terriers have averaged about 44% on defense in terms of third down conversions. Last week, ETSU came into the game averaging 30% and finished the game at 50%. The Chattanooga defense is averaging a similar rate with 41% and offensively we've averaged about that much too. So the key for us to win this game will be ball control and third down conversions. If we don't turn the ball over and maintain our average (or improve upon it) offensively and our defense gets off the field on third down, we'll get away with a W.
Personally I would love to see our defense come with some new blitzes up the center. Our big guys handle their offensive opponents so well it would make sense to shoot safeties or LB's up the center. We need to change it up and confuse our opponents. On offense I would like to see us plan on throwing it 20-25 times and run it 35-40 times. We have at least one QB who makes quality throws and knows how to keep it out of the hands of the defense. We have receivers who have shown they can flat out catch the ball. I would like our coaching staff to expect us to score 35 points per game and plan the game that way. We need to get more aggressive on both sides of the ball and let our guys start having fun, rather than making it a drudge winning close games. If we have more talent than ever it is time to start showing it. I would not want to see us throwing the ball 25 times a game. The thing with throwing 25 passes a game is that if you do that you should aim to complete 60% of those. Our completion percentage has been stuck at 50% since Ben Widmyer graduated about a decade ago. In regards to our passing game, I just want us to remain efficient with our use. Well timed passes that keep the defense off balance and create / manipulate good matchups for us. Well timed passes, deep take the lid off the defense passes, some short intermediate ball control passes, and when we have the 1 on 1 matchups. One very successful set we use the best IMO is a 2 receiver set on one side usually J hill out wide and RJ in the slot, 1 receiver on the back side, and Blake and Lennox in the backfield, this allows us combo routes with J Hill and RJ, allows a blocker to remain in and block from the backfield, and allows us to slip Blake in underneath against a Linebacker or safety. So we have good matchups across the board, RJ in the slot either has a backer or safety, same with the back out of the backfield......we are very successful exploiting that offensive set. For possession and for significant gains. Now that set can be manipulated further by adding. Tight end either on the twins side or on the backside also creating more matchups. There have been a few references made to a renewed/peaking Mocs team. Does anyone know what changed to make them more successful? I would say a full year in a new system and staff. The team is finally grasping the new staff's playcalling, and strategies. Also, Chatt was reeling with injuries at the QB position earlier in the season, maybe the new QB is settling into a more comfortable role. 19 u r correct in your assessment of Chat's turnaround/resurgence. I would like to add one thing though. I watched the Chat Sammy game - the last game that either team played. You would think that Sammy would have played with confidence but it seemed like the opposite at least to me. Hodges had a bad game especially so because he is such a good one. Once he attempted a pass and for whatever reason the ball just slipped and he was lucky it was not intercepted. And there were other plays where he fumbled and if I remember correctly he threw an INT. And his teammates fumbled too. And Chat had trouble holding on to the ball too and gave Sammy ample opportunity to win the game. It could have been the weather. It was fairly cold or maybe just cooler than usual. Cooler than the players had been used to all season. And then Sammy had key injuries - McKnight and a player on defense went out and did not return. And there may have been other injuries that I forgot about or did not know. To sum it up Sammy IMHO played a relatively lousy game and practically gave the game to Chat. Although there were good plays on both sides. The game was not totally a game of mistakes but Sammy could have played better. So IMHO Chat did win the game and deserved it. But with Sammy's lackluster playing especially the fumbles the W is not as significant as it seems at first glance. Hodges threw 3 picks. Samford muffed at least one punt, maybe 2, and turned the ball over 7 times. Chatt turned it over 4 times as well. I know we run the 50 defense, but everything I've googled about it says it's basically 5 DL. On the surface it doesn't look like that's what we run. Our scheme, on the surface, better resembles a 3-4. What's the difference? I think what I'm trying to say is we run a 50 alignment with 3-4 personnel. Meaning we don't have traditional DE's that are 6-3 260 lbs type of athletes, that are placed over the OT or TE. We replace the DE position with stand up LB's that are 6'1 225 (Terrance Morris, Darryl Vinning, Jireh Wilson, etc.). This looks like the same defensive scheme we had when Ga Southern and App State were in the league. A Nose Tackle head up or shade of center (Mikel Horton) and 2 DT's (Miles and Vaughn). The main difference is the size of the athlete and the techniques used (5 or 2 Technique, 2 Gap or 1 Gap). Basically the only man that can get doubled would be the NT (unless our LB's align inside of OT') in our 50 alignments.